A highly innovative solution using 217 twenty ton pre-cast, tilt-up concrete panels employed for rowhomes, designed to harvest a maximum of natural light and air. The program was to fit 17 single-family detached for-sale homes on a 17,500 sf urban in-fill lot. A highly innovative solution of using 217 twenty ton pre-cast, tilt-up concrete panels was employed. At only 15’ 6” wide each row home was designed to harvest a maximum of natural light and air. The result, homes that are 42% more efficient than State-mandated energy standards and virtually zero maintenance, impervious to termite, mold, and water damage. As downtown San Diego has no alleys, the project created one to establish a “working” courtyard which has had the positive affect of providing a community gathering space for various cultural and civic events. 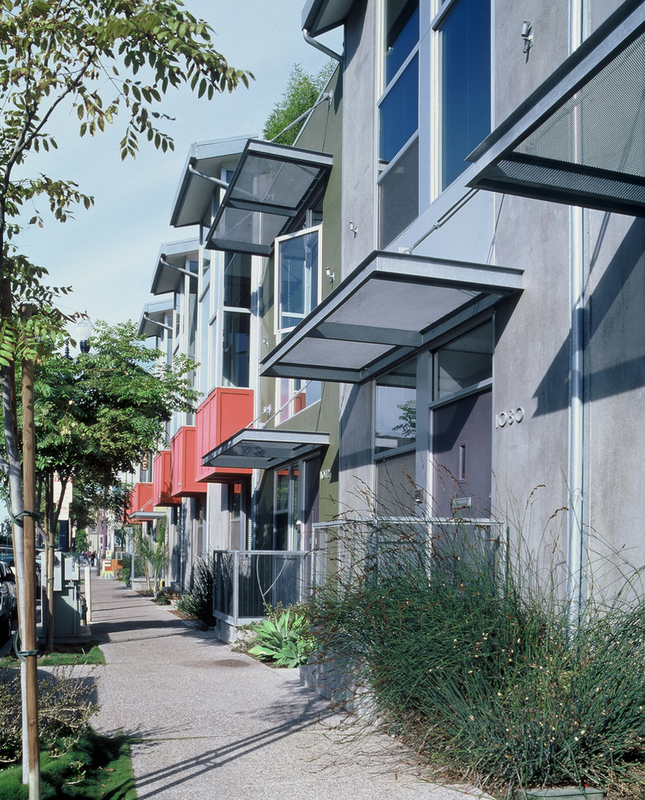 The street scape thoughtfully borrows from timeless strategies of engaging the sidewalk; large overhangs, enhanced landscaping, and individual street-level stoops. Overall, this forward-looking project models a viable residential design strategy which begins to answer issues such as increasing urban density, cultivation of neighborhoods, natural resource conservation, and environmental sustainability without sacrificing a modern design aesthetic.